Every Content Strategy is a collection of stories about customers, products, services, accomplishments and industry insight. Collectively they define the entire company experience. Individually they tell partial stories. Reviews tell customer usage stories. Search behavior tells stories of how consumers find your products and services. Product information tells solution stories. Thought leadership tells industry-related stories. Blogging tells complex stories incrementally – they can educate, engage and entertain. Case studies persuade and tell stories of success. One reason speakers like to start a presentation with a story is because stories are easily remembered by attendees. By a ten to one margin people remember the story over the statistics that were presented. 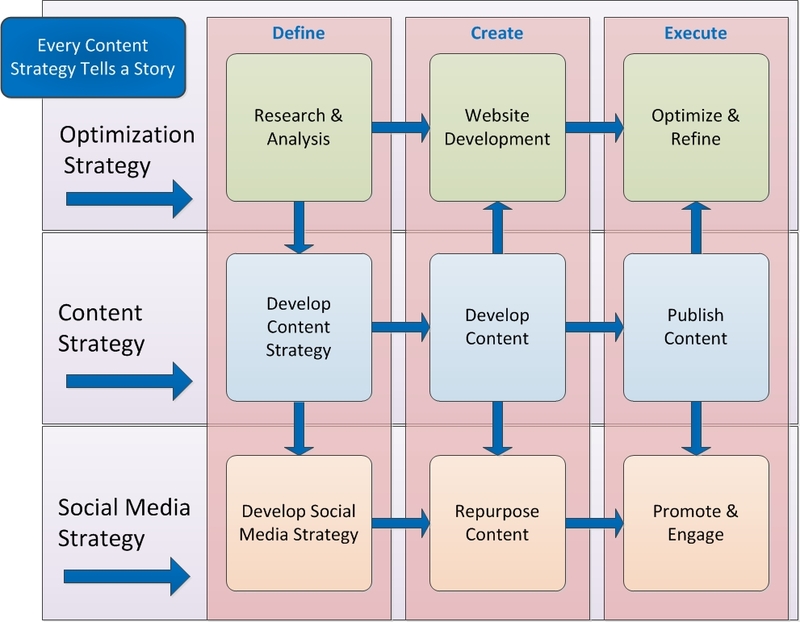 Define your optimization, content and social strategy as a holistic group. They are connected at the hip, and do not function independent of each other. Create an optimized website presence that enables the distribution of high-quality content through multiple channels, i.e., search engines, your website, social platforms and social syndication. This starts with Advanced Keyword Research (i.e. Search Behavior Modeling). Execute. You must continually publish new content, and optimize and refine your website presence. It’s important to recognize that Advanced Keyword Research (search behavior modeling) and a solid website audit are the key foundation building blocks that define your content and website development strategy. Search Behavior Models reveal how consumers are searching for your products and services. A Website Audit tells you if your website supports existing consumer search behavior. These critical tasks drive your website development and content strategy. Get your keyword research right and everything else falls into place. The following graphic reflects how the three strategies interrelated with each other. That you will provide them with high-quality content that solves a problem. They expect you to provide this service. Good content starts, and supports lead-generation development. No content – no leads. If you don’t educate them, you are unlikely to transact with them. Good content help build brand equity, and allows you to develop a unified message across multiple channels. This supports lead generation activities, and satisfies visitor expectations. One way to calculate potential ROI is to understand the value of the traffic generated for any of the ten position on page one search results. For example, the second listing drives five times the traffic as the seventh position. If you are interested in finding out more about how your Content and Optimization Strategy can drive Social Distribution and Lead Generation send me an email at: Mark@MSprague.com, or call me now at: 781-862-3126. You can also fill out this contact form and I will get in touch with you. Developing a superior data-driven content strategy for your website. Understanding your customers’ search behavior and adding it to your content strategy.